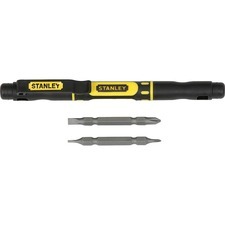 The 4-in-1 Pocket Screwdriver offers four drivers in one small tool that fits perfectly in your pocket. Two double-ended bits with convenient tip sizes include 5/32" standard, 1/8" standard, No. 1 Phillips and No. 2 Phillips. Versatile, compact tool is crafted with magnetic bits to easily attract and hold small screws and with soft bi-material grip for comfortable use. Nonslip textured surface provides a secure grip and increased torque. Screwdriver is ideal for toy assembly, battery compartments, eyeglasses, electronics and more.